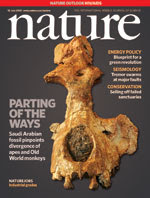 The cover of this week's Nature announces the discovery of the fossilized remains of a previously unknown primate that provides clues to the divergence from monkeys to apes. The discovery was made in Saudi Arabia - and I hope this spurs further interest in paleontology and other related sciences within the region. Just as Pakicetus (a whale ancestor) points to its discovery in Pakistan, this new fossil has been named Saadanius hijazensis, owing to its location of discovery. You can read more about the discovery here, and access the full journal article here. This fossil cranium of a new stem catarrhine from western Saudi Arabia allows palaeontologists to place a more accurate date than previously possible on the divergence of cercopithecoids (Old World monkeys) and hominoids (apes and humans) within Old World higher primates (Catarrhini). The new specimen dates to the mid-Oligocene, around 29 million to 28 million years ago, and has no crown catarrhine specializations other than the presence of a tubular ectotympanic, suggesting that the divergence of Old World monkeys and hominoids happened after that date. The cover shows the anterior view of the cranium, which has its lateral incisors, canines and broad molars in situ. The size of the cranium indicates a medium-sized primate, between 15 and 20 kilograms in body mass. Photo credit: Daniel Erickson/Bonnie Miljour, University of Michigan. This is very exciting and interesting actually. I really hope it would increase the interest in palaeontology in the region - this region has a huge potential and isn't well studied at all... such discoveries may even ease the local populations to the evolutionary thought, too. May be I am too optimistic?